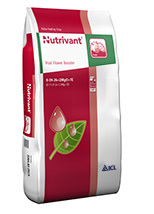 Fully soluble formulations that contain macro-, micro- nutrients and secondary elements that cover crop’s needs. •	It enhances the permeability of the cuticle to active substances. •	It ensures even spreading of the drops of spray on the surface. •	It firmly attaches the active ingredients to the leaf surface, and delays evaporation.